MMWD is offering free table tents to local restaurants to help them spread the word to their customers about conserving water. Under the district’s water conservation code, restaurants may serve drinking water only upon request. In response to the drought, we are reaching out to restaurants to remind them about the requirement, which was adopted by MMWD’s Board of Directors in December 2009. The table tents are designed to make it easy for restaurants to educate their customers about the requirement and to save water and money. When you think of the number of people who dine out in Marin, the number of water glasses that go untouched, and the water needed to wash all those glasses, the savings really add up. So far this year, MMWD has given away about 2,000 table tents to local restaurants. The table tents are available free of charge to businesses within the district while supplies last. To order, email MMWD’s Water Conservation Department or call 945-1520. 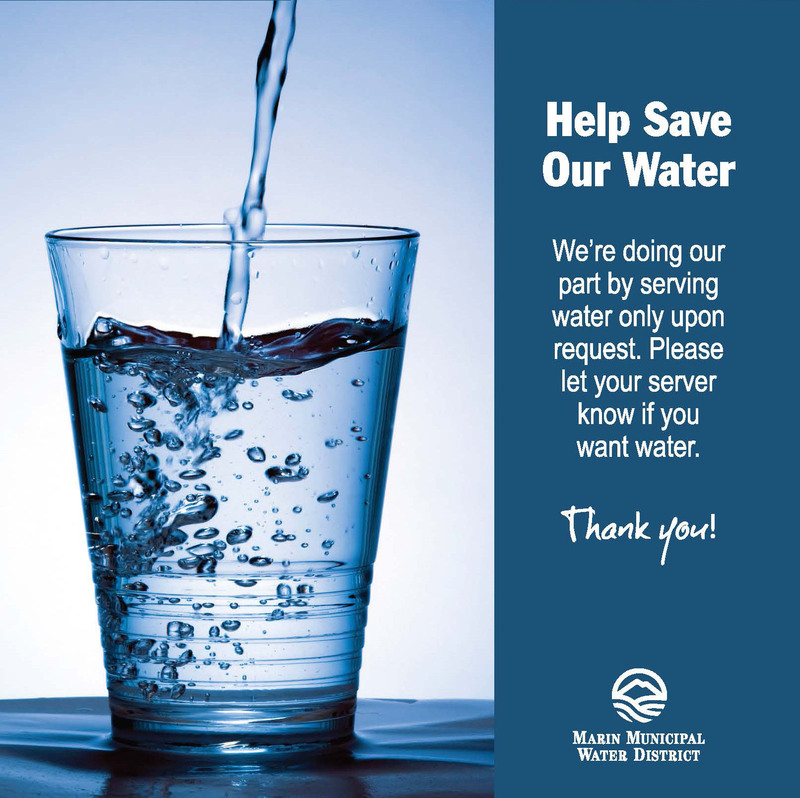 MMWD also has launched a new social media campaign to thank local restaurants who are saving water by serving drinking water upon request. Does your favorite restaurant serve drinking water on request? Show us! Send a photo to MMWD’s Public Information Department. We will add it to our photo album, credit you, share the photo on Facebook and Twitter, and “tag” the restaurant to let them know their conservation efforts are making a difference. Although local reservoirs are fuller than average this summer, there’s never enough water to waste. We rely on rainfall stored in our reservoirs for 75 percent of our water supply. Since we never know how much rainfall the next year will bring, it is important to use water wisely to help ensure a reliable supply for the future. Most of our customers are very conscious about using water responsibly and may not even realize they are wasting water—so that’s why we point it out when it comes to our attention. Eliminating water waste can also be an easy way to bring down your bill. Washing sidewalks, walkways, driveways, parking lots and all other hard-surfaced areas by direct hosing, except in cases of public health or safety hazard. Use a broom instead to save water and get a little exercise at the same time. Water leaks or breaks that are not repaired within 48 hours of discovery or notification from the district, whichever occurs first. If you find a leak or have a pipe break, please make repairs promptly. Non-recycling decorative water fountains. Make sure that any decorative fountains recirculate the water they use. Wasteful irrigation practices that allow water to run off or overspray the areas being watered. Water plants, not pavement! 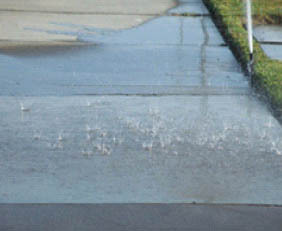 Any excess water runoff flowing onto the public right of way at a rate of one gallon per minute or greater, with the exception of storm water and naturally occurring groundwater. By keeping water on your property under control, you’ll also help prevent polluted runoff that can harm our creeks and the Bay. If you see a water waste condition—or if you need help identifying the cause of water waste on your property—email our Water Conservation Department or call (415) 945-1520. A guide comes in many forms. It can be a person guiding you through a foreign city or on a safari. It can be a road sign, pointing you in the direction you should go. It can be the North Star, showing you which way is north. And if you’re setting out on a landscape installation or rehabilitation project, our new Landscape Plan Review Requirements: User’s Guide can help you navigate the process. For those unfamiliar with Marin Municipal Water District’s (MMWD) code, the section of the code related to water conservation (Title 13) includes landscape plan review requirements. To help protect our limited water supply, a homeowner or landscape professional is required to submit plans to MMWD demonstrating that their project meets certain water efficiency standards. The User’s Guide will guide you as you design your project to ensure it is in compliance with the code. Let’s go through a simple example. Let’s say you want to know if your project is exempt from the code. You open the User’s Guide, turn to the table of contents, and immediately find a section dedicated to compliance and exemption requirements. On page 9 you find the answer to your question which includes the code number, the actual language of the code, the intent of the code, and any notes that may help clarify the code. The guide also includes contact numbers, workflows, and an appendix of forms, tables, and definitions. The User’s Guide will be continually updated with new information, so check back often. Crack open the User’s Guide today to see how it can help guide you with your next landscape project! MMWD has officially moved into a new, more progressive era of water conservation. On December 16, the Board of Directors unanimously adopted Ordinance 414 requiring high-efficiency appliances and more water-efficient landscapes throughout the district. Ordinance 414 will result in 20-50 percent reductions in water use for new construction and remodel projects. This is accomplished by requiring high-performance toilets, faucet aerators, clothes washers, and smart sprinkler timers. Requirements vary depending on the size and type of construction project you’re working on. These new technologies not only save water, energy and money—they also perform better than their less water-efficient predecessors. Please contact district staff if you have any questions at (415) 945-1520.